This section covers the definition and benefits of using Gamification in corporate training. • Is Gamification only fun and does not lead to learning? • Can it truly impact and enhance learning? This section outlines usage of Gamification in various areas of corporate training. It showcases how you can use it to engage your employees and boost performance. This section looks at aspects that are on top of your mind (particularly, when you look at integrating it for the first time). These include aspects like impact of Gamification vis-à-vis traditional eLearning strategies and suitability of Gamification to meet training needs. 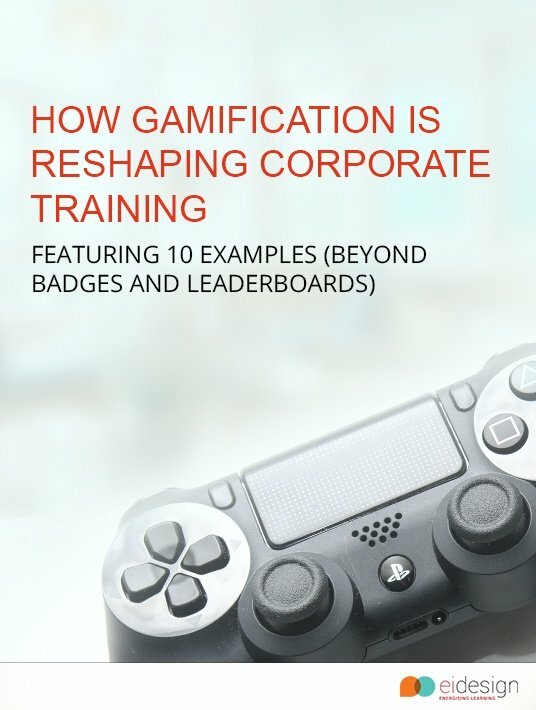 In this section, I pick a range of examples that show the evolution or maturity of usage of Gamification for corporate training. My examples how you how you can apply it – from entry level partial Gamification, to Game-based/Gamified concepts and thereafter to the next-gen Gamified portals that integrate Social Learning and Microlearning techniques. Usage of Gamification for corporate training (particularly for serious learning that is, meeting specific learning outcomes) is more than a buzz today. In its journey and evolution over the last five years, Gamification has become a significant part of organisational learning strategy and is clearly reshaping corporate training. How Gamification Is Reshaping Corporate Training is a must-read for organizations that take their serious learning…seriously and wish to add gamification to their online training strategy to boost employee performance!